What’s the Project? Christmas traditions are one of the things kids will remember for years and years and those special memories will bring your family closer together. If you need some ideas to get you started, here are some fun ideas to get you started! When I was little, every year my grandma would give each of us a new Christmas tree ornament to hang on our tree. She’s spread her table with a bunch of options and we’d draw numbers to see who got to choose one first and then select an ornament from those options. I still have those ornaments and they still hang on my tree. And I love looking at them and thinking back on my childhood. 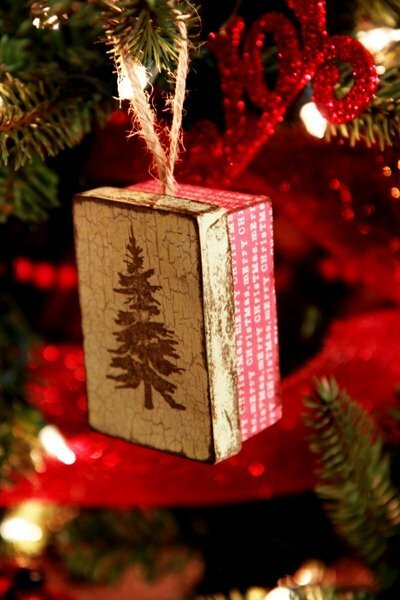 Do you have Christmas traditions and memories like that yourself? Most of us do and want to create that for our own families. 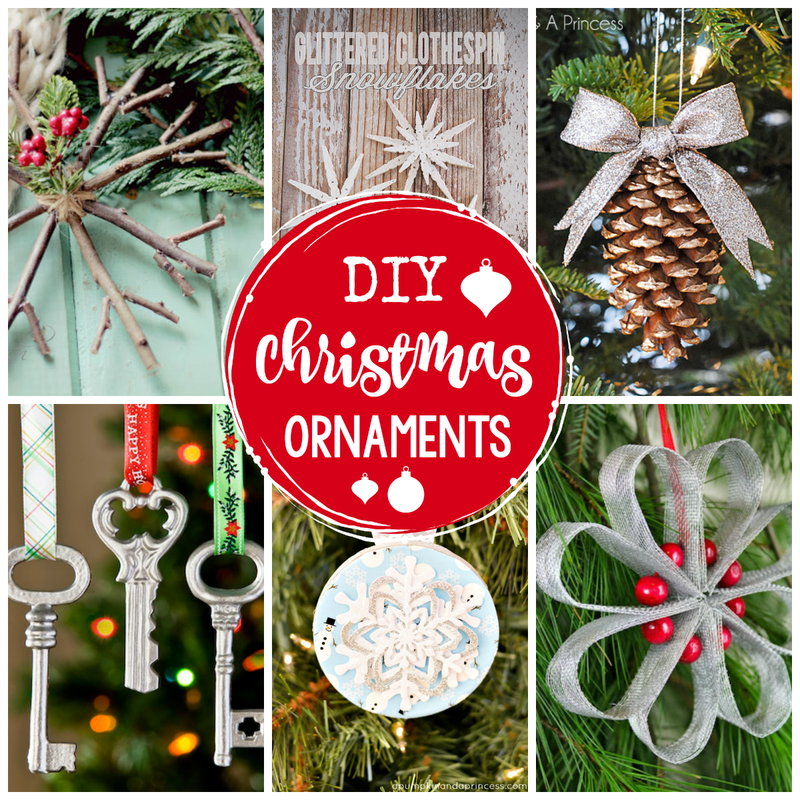 If you are wanting to start some great Christmas traditions and need some ideas to help you get started, here’s a great list to get you going. It’s the traditions in life that make it sweet, isn’t it? I love how excited my kids get for the traditions we’ve set in our family for Thanksgiving, for Christmas and year round. Christmas traditions with kids are so essential to building a strong family. So let’s take a look at some great options! 2. Christmas Eve is a common time to have a lot of your Christmas traditions, right? A favorite one we’ve tried is to have a fondue dinner. We’ve done cheese, meat and chocolate, although that’s a lot of work, so you could cut back a little and do just cheese and chocolate or whatever is your favorite. 4. This 12 Days of Christmas with stories and coordinating treats from The Craft Patch looks super fun. She’s got all the links to stories ready for you so it’s easy to pull off. Very fun idea! 5. This is my family’s very favorite Christmas tradition-eating pizza by the light of the Christmas tree on the first Monday in December. We look forward to this year after year. 6. And to go with that pizza by the Christmas tree one, n that night I give everyone a Christmas tree ornament that symbolized their past year. I love to get these on Etsy because then I can have them very customized. 10. This is a Chistmas tradition that originated in my husband’s family and we still carry on the tradition with them. In the past, my mother in law would bake tons of cookies and put together a cookie plate each day throughout the holiday season with a variety of cookies (and I do mean a variety!) so that everyone could have their favorite! 11. 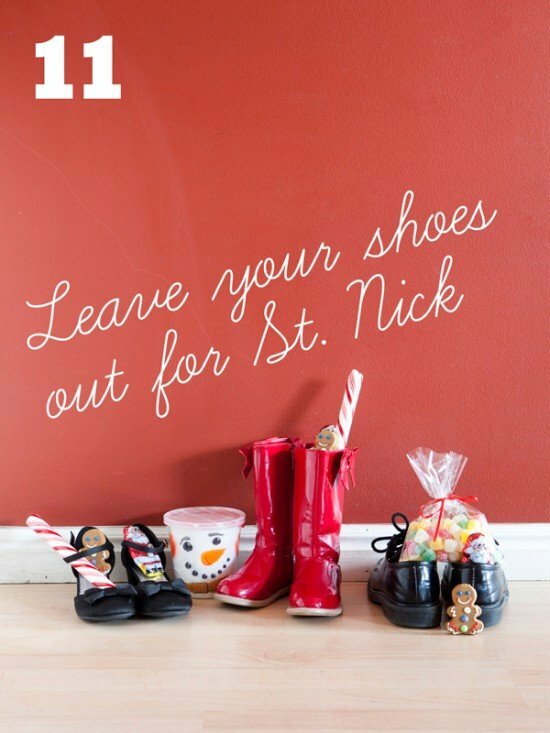 Do you celebrate St. Nick’s Day? It’s a fun one to do in early December. We’ve done this a few times and had fun with it! My kids’ school teachers have done it too. 12. I know that many people do this, but neighbor gifts are one of my very favorite parts of Christmas and one of my favorite Christmas traditions. I love having a chance to knock on my neighbor’s and friend’s doors, hand them a gift and let them know that we think they are great! 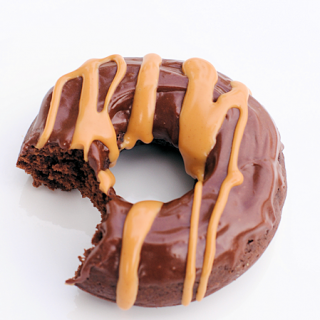 And I love when I hear that knock on my door and know that someone is bringing me something yummy or fun! Need some inspiration check out these neighbor gift ideas and fun Christmas gifts for friends. 13. And have you heard of the Christmas Pickle before? This is a super fun idea! 14. This is my very favorite idea for an advent. It’s an activity each night counting down to Christmas. This one will keep you busy but if you plan ahead you could probably pull it off! 15. One my family has loved is going ice skating together! It started a few years back when we needed something to do on Christmas Eve during the day and came up with the idea of ice skating. Which turned out to be a blast and very uncrowded since most people were out making final preparations. Now we try to go at some point during the season and apparently my kids love it because they have been begging me to take them again this year (and I will). 16. 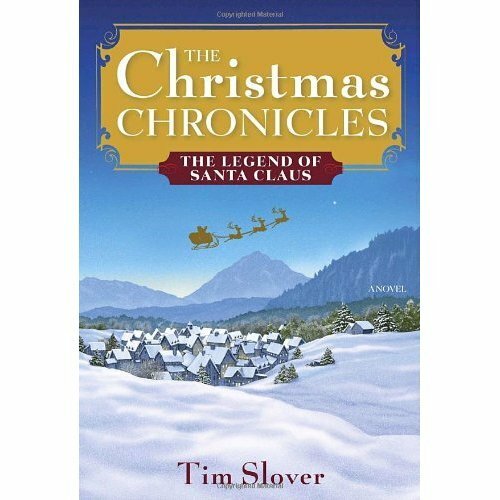 I have to tell you about this book-The Christmas Chronicles. Our tradition is to read it out loud as a family in the month before Christmas. It’s a really neat book! 17. Have you ever done a service scavenger hunt? This is in my top three for favorite traditions. It’s one we started just a few years ago, again when we needed something to do during the day on Christmas Eve. We broke into a few teams and hit the town for a couple of hours to see how much service we could pull off in that time. We did everything from taping quarters on vending machines and leaving dollars in the dollar store to taking doughnuts to the police station and buying needed items for the homeless shelter. Or we love to go through a drive thru and pay for the person behind us. The boys also remember fondly the year that we shoveled neighbors’ walks and the list goes on. There are endless possibilities of things to do. We have done this with other families too to make it a competition between us all. We ended with pizza and a prize for the people who did the most service! A great way to spend Christmas Eve. 18. Play the Right/Left passing game. This is a tradition that my Grandpa started in my family when I was a kid. Granny and Gramps would buy a bunch of candy bars at the store and wrap them up. Then Grandpa would read the Tommy Wright story (here are a bunch of versions) aloud and everyone passes the gift left when they hear the word left and right when they hear the word right. At the end of the game you get to open and keep the one you are holding (or trade with your neighbor if it isn’t your favorite). This is one that my kids insist on every Christmas Eve! What are your favorite Christmas traditions?! 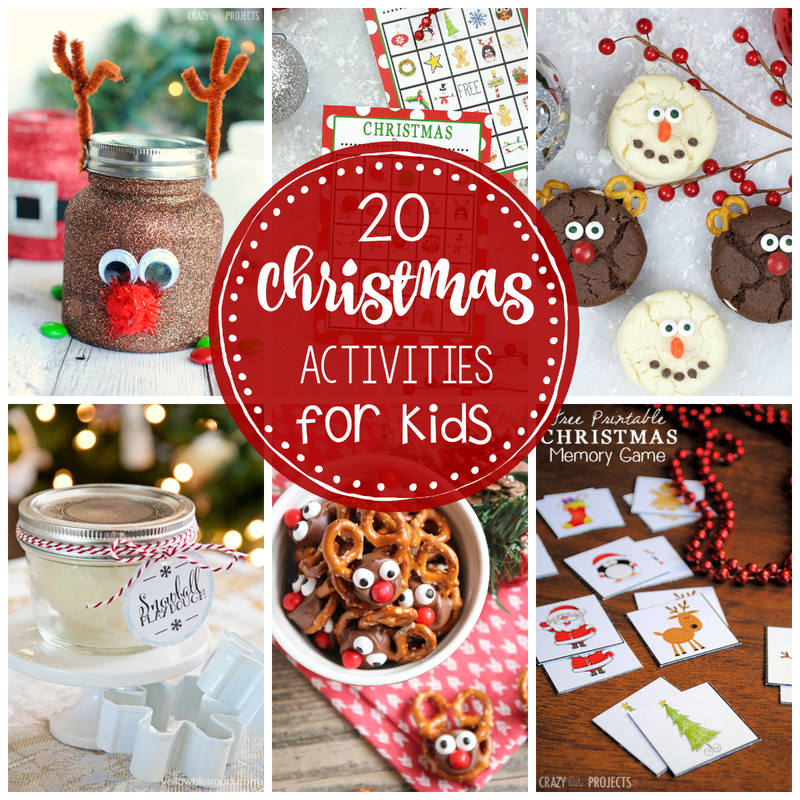 I hope you have a wonderful holiday season with all of these fun Christmas tradition ideas. Greetings from the UK. Thanks so much for all the wonderful ideas, I can’t wait to try some! When I was growing up, my Dad never read us stories as he had such bad dyslexia. However, every xmas eve, we’d get into our pjs before bed and sit around the fireplace. Dad would put the log fire on (the only time we had it on! ), we’d sit around it and he’d read “Twas the night before christmas”. I now know he knew it off by heart! We’d then hang our stockings, put out the mince pie and carrot for father xmas and ruldolph and toddle off to bed. I lost my Dad before I had children, so it seemed natural to start that tradition with mine and every year, I can still hear his voice and it feels like he’s there. Oh that’s sweet. thanks for sharing that! 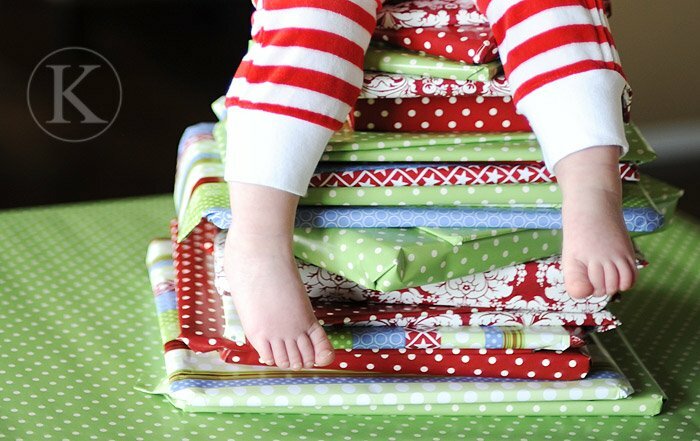 We don’t have littles yet, but I’ve been searching around for some Christmas traditions to incorporate. So far, one I have from childhood is that we always got our Christmas tree on whatever Sunday fell closest to my birthday (the 8th). We went as a family, cut it down and then spent the afternoon trimming. A new one started with my husband when we were dating. We exchange 4 gifts with each other. Three based on the gifts of the 3 wise men, Gold, Frankincense and Myrrh. Gold is something that the other REALLY wants, Frankincense is something practical like a hat or gloves or hand-knit socks, and myrrh represents something especially meaningful between the two of us. The 4th gift (and boy do we have fun with this one!!!) is Patchouli and it is typically a funny gag gift. Out of all the gifts, we have come to look forward to this one the most as it usually ends up being or becoming the most meaningful of them all. The 4 gift limit keeps our budget in check and we do try to make by hand what we can. There are certainly some great ideas here that I want to adapt to our family and I thank you for putting them together. Merry Christmas! 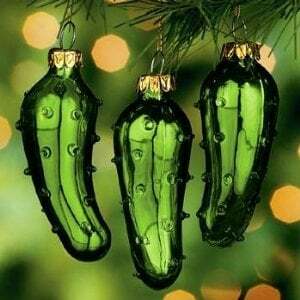 We grew up doing the pickle ornament. It was a fun tradition! I like that it was never too trendy- but I’ve been seeing the pickle ornament all over pinterest, so I wonder if that’s about to change. FYI – I have seen the pickle ornament at the Dollar Tree stores. Looks like fun! I love all of these, especially the 12 Days of Christmas one! My family never had a ton of Christmas traditions, but it didn’t make the season any less special. One that I loved was my dad would take a day off work and take me out of school before winter break so we could go shopping for my mom (I am an only child). It was so much fun playing hookey and having the whole day with my dad! That’s definitely one I plan to continue with my kids. We do the pickle ornament. We also celebrated Jesus’ birthday with a birthday cake. We did the candles and sang the Birthday song. My Family has a tradition of the Christmas Angel. When I was growing up the Christmas Angel was so magical to me… I had a hard time believing in Santa Clause, but I believed in Angels, and every year, I would wake up on the day after Thanksgiving and the Christmas Angel had arrived! She had decorated a small tree in our kitchen, hung up small stalkings in the window, inspired my mom to cook a lovely breakfast and left us all gifts under the small tree. Every year the gifts always contained an outfit for us to wear to church on Christmas and our very own Christmas tree ornament. The Christmas Angel now visits my children, although she does things just a little differently, as we don’t have a large kitchen that fits a tree. When the Christmas Angel comes to our house, she sets up our large Christmas tree and decorates it with lovely white lights, and places an Angel at the top of the tree. My Children wake up on the morning of the day after Thanksgiving, and find that the Christmas angel has ushered in the Christmas Season with our tree, our stalkings hanging on the fireplace mantel, a warm breakfast baked by yours truly, and yes, a gift for each child containing an outfit to wear to all their Christmas Parties, and Church on Christmas Sunday as well as their very own special ornament to put on the tree. From that day on, more decorations go up, and Christmas music is prevalent in our home. It’s my favorite tradition that I love celebrating with my children, and I hope they too will celebrate it with their children someday. Oh that is SUCH a neat tradition!!! growing up, my mom would save all the small candy boxes from Halloween(milk duds, junior mints, and ju-ju beads) and fill them with small trinkets. each sibling would get 24! boxes. they were placed in a basket in the living room. each morning we would open ONE. usually it was a quarter, pencil topper or small candy-whatever could fit. I continued this tradition with my kids who are now grown :( but when they were small, their aunt gave them little trees to keep beside the bed-kind of like a nite light. I would tuck them in and when they fell asleep, I would put one of those small packages under. have to say there were a few nites I forgot and was swiftly reminded in the morning. they still put the trees up and I try to add little trinkets here and there. after all, they are 19,20 and 23 :) but they love it! My husband and I exchange an ornament every year. After 10 years we each have 10 ornaments with special meaning, plus our children’s who have been incorporated over the last few years. We go to things remembered, but you could also make them yourself. We try to get the ones with picture frames to include a favorite memory from that year too. 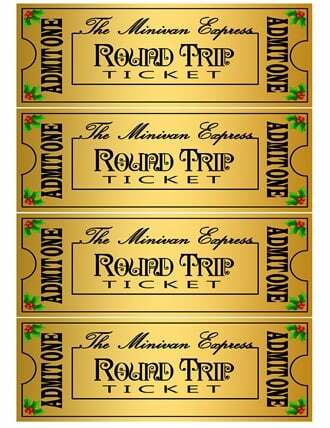 We also have fondue on Christmas Eve and watch the polar express in our pjs with hot cocoa. Wow! We could be friends! We do all three of those traditions too. 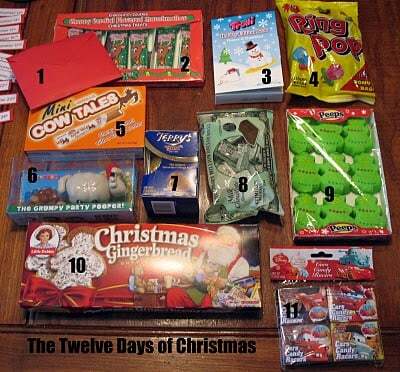 Oh I would try to get the twelfth day so I had a small part!!! We hang Christmas j’s from the tree. They are upside down candy canes. They signify Jesus, red for the blood he shed and white is the Holy Spirit making us white as snow ( clean slate) kinda tricky to get them hung up upside down tho to make J’s. We only do 3 gifts each for the kids, like the 3 wisemen, and we also make a cake for Jesus and sing the song and all. Thanks for posting we can always add some new ideas to our new little and still growing family. Such cute ideas. We have done the ornaments every year for Christmas, which makes for great memories through the years. Also love Christmas light looking! Have wonderful Christmas! I have 2 little boys and every year on Christmas eve everyone opens one present and its our pajamas for Christmas morning. It gets eveyone in the mood for the morning to come! My family, my sister’s family and my mom & dad all make a ginger bread house with our families and then on Christmas day we bring our house to my mom’s for our Christmas celebration and the houses come together to make a little village. It’s fun! We grew up with special stockings, stuffed with fruit, nuts, small toys, etc. Stockings were a big deal. As we grew up, all of us wanted to be able to put our own stocking stuffers in everyone else’s stockings and the normal size ones just didn’t cut it. So I bought tons of denim and made everyone in the family a REAL Texas sized stocking. They are over 3 1/2 feet tall and 15 – 30 inches wide at top and toe. I mean HUGE. Under a large cuff at the top, I insert a ruffle. Each person’s ruffle is something especially chosen for that person, reflecting a hobby, a collection, a nickname, etc. but all very unique to that person. 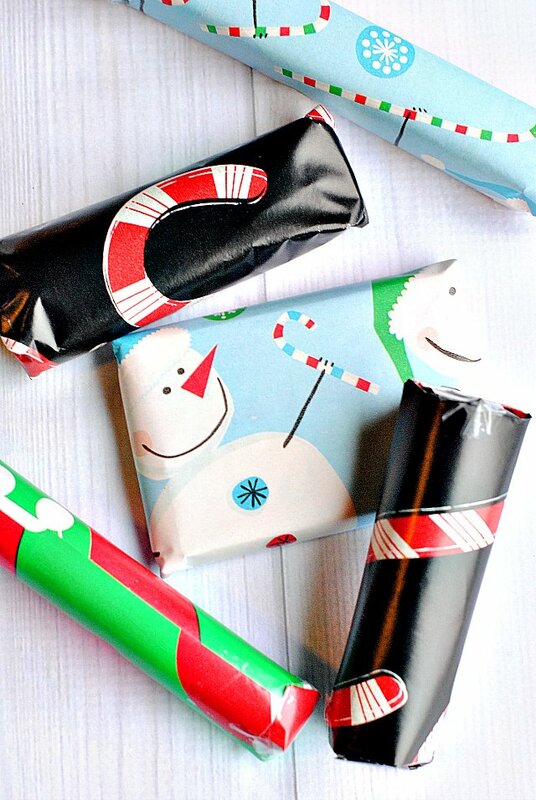 We all search throughout the year for really cool or special goodies to go in the stockings so opening them is just as much fun as opening presents. Since we’ve acquired a new grandson, a new son-in-law and a soon to be new daughter-in-law, I have some serious sewing to get to pretty quickly. Believe it or not, some years even these stockings aren’t big enough! Oh my word! That’s awesome. Stockings are SO much fun to me! Great list. We live on a sailboat so each year we are in a different location. Since I can’t collect or keep a lot of stuff we make most of our decorations each year. This includes putting together our own “fireplace” – red/white garland for fire and paper-towel roll logs. No Christmas is ever the same. We also do jammies and read the Night Before Christmas on Christmas eve. In the front cover of the book we write down where we are that year. My husbands family also has a great stocking-stuffer tradition. They each buy something for each others stockings. The trick is to find something that isn’t obvious what it is. Then it is a game to see who can figure out what each of the items are. This is the only thing the adults exchange – gifts are reserved for the kids – but it gives the adults something to look forward to too. Each year everyone gets a new ornament. Pertaining what’s going what’s going on that year. I put the year on it some where. They love it and look forward to it. I came by to bring your presents but you were still awake. Get ready for bed, I’ll be back when you’re asleep. The package is pajamas, which he hurries to put on. We leave Santa and Rudolph a snack and off to bed he goes. We never have any trouble with him staying up late on Christmas Eve. 4. I think this is my favorite. Every Christmas morning, before anyone goes downstairs we take the Baby Jesus and as a group sing Happy Birthday. My parents started this long ago as a way to remind us the true meaning of Christmas. I have given my daughter an ornament every year since she was born on Christmas Eve She is now 29 and has given me a grandson and we passed this tradition on to him he has 8 ornaments one from each of us for each of his Christmases and we are hoping for a girl by Christmas 2015. I started this with my Daughter when she was a newly wed, She was married in December so it seemed like a good thing to do. My Birthday is 12/21 and every year on my Birthday I give both of my Daughters and my Son-In-Law an ornament for them to use now (the Married Daughter and son-in-law) and for my Teen age Daughter for her to save and have on her tree when she moves out and has a home of her own. Sometimes I get them each 2 ornaments. By the time my 16 year old moves out she will have quite a collection. This is a great post I will definitely be trying some of these traditions. Last year (my eldest was 2 and half and youngest was 9 months) we started our own tradition. We were in the kitchen baking cookies for santa and when we came back through to the sitting room there was a present under the tree and it had a tag saying “You have been such good boys this year so we wanted to leave you some things to keep you busy while you wait for santa, remember to keep being good and have a wonderful Christmas. Love Santa’s Elves.” They were both so excited opening the box, even the baby. It had new pyjamas and slippers for them both Christmas books, a dvd and lots of snacks and treats. We will definitely be carrying this tradition on as it was such a hit. We were poor growing up and my mom was very frugal. Once all the presents were opened my mom would save as much of the wrapping paper as posible. The next year present would be wrapped in the same paper as the year before. This continued all my life till she passed away in 2002. My sister and I would commit on what was wrapped in the paper from the year before. “This was on your present last year when you got…” or “I remeber when I was 10 and this paper was on my….” The size of the paper would be smaller each year so the gifts would be put into what ever paper they would fit into. It was nice to see the same papers from when we were kids each year. I think some of the fun was the paper more than the gifts. Another tradition was opening one gift christmas eve. I would always find the one from my grandma which was a jar of her home made apple butter. Toast and apple butter for christmas morning YUMMMMY. I just want to thank you for posting this list. 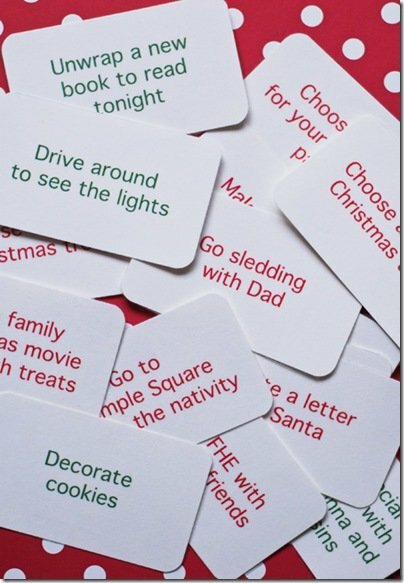 I have seen many ideas for Christmas traditions on the Internet, but these are really great. You did a fantastic job putting all these super ideas together. 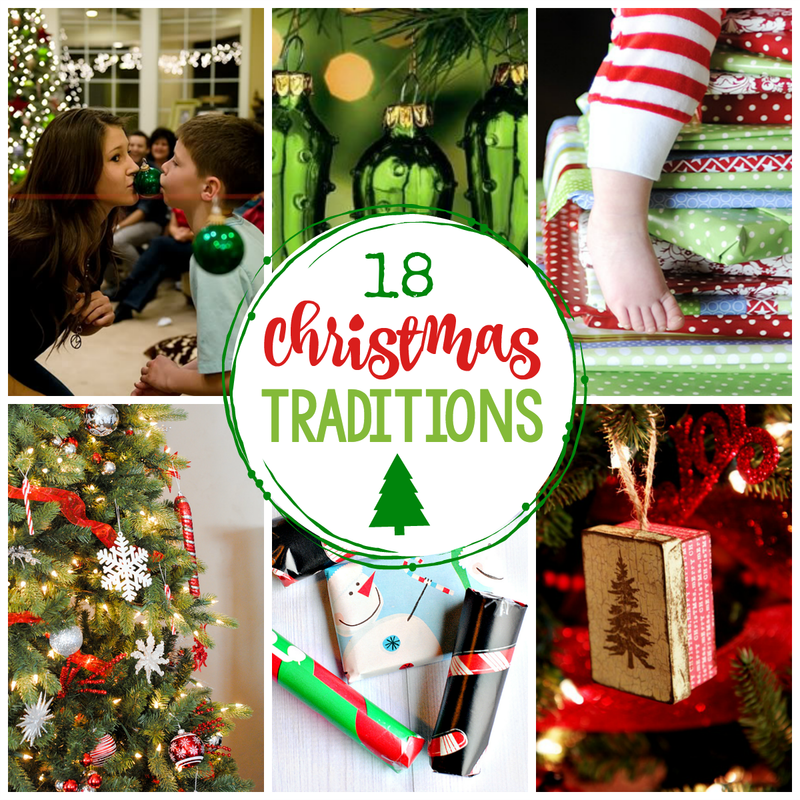 Even though my children are 11 and 15, we will still enjoy many of these traditions. Thank you!! Last year was my daughter’s first Christmas, she was 11 months at the first of December. I was given a small 2 foot tree and put it up November 30th, and then I hung 5 mini gift bags on the wall outside her room. Every morning, she opened a bag and inside was an ornament that we put on the tree. Every 5th day I refilled the bags. A lot of the ornaments were ones I had from years past, but on Christmas Eve she got her ‘First Christmas’ one. This year, instead of hanging them in bags, I plan on getting her Elf on the Shelf (which we received as a gift last year) to bring the ornaments each morning, When baby #2 is born mid-December, Elf will bring one for each and on Christmas Eve, baby will get her First Christmas one and my daughter will get a new one as well. When the kids are older and we have space for a large tree, the Elf will probably bring a load of ornaments mid month to fill it in, but for now the 24 is a nice fit. Each year thru age 21 my kids got a new ornament every year that represented something special about that year…a wagon, a bike, a swimmer, a scout, karate kid, driver’s license etc. Then, when they graduate from college and move on, they get to take their ornament box to their own place and they have special memories to hang on their trees. I tried to remember to use a sharpie to put the date on each ornament so they knew what year they were from. Love reading everyone’s stories and traditions! We’ve done the elf on the shelf, and my little girl finds it absolutely fascinating! Lol. One tradition my husband has done since a child, and one we continue to do in our own family, is lighting a candle for Jesus at midnight on Christmas Eve, and giving many thanks for all of our blessings, along with wishing Jesus a “Happy Birthday”. This year, we will.be incorporating more Christmas traditions..I’ve highlighted a few from above;) Thanks again everyone! Have a wonderful and blessed Christmas! When my children were little we had 24 books. They picked one each night to read. Christmas we read Twas the Night Before Christmas and Luke 2 from the Bible. My favorite of the books was Santa and the Christ Child. It was lost or borrowed over the years. I searched for years to replace it but never could find it or it was too pricey. My sons last year home he surprised me with a copy and a hand written note. I do not have any grands but I have already started buying a book a year to share with them the fun, magical and TRUE meaning of Christmas! Hey! I LOVE LOVE LOVE the Christmas Chronicles! We listen to it a couple times throughout the year. The cds are awesome. The voice cast is fantastic and adds a lot of magic to an already magical story. We just keep them in our car and anytime we are all together listen to it (let’s be honest, sometimes our rides are extended greatly so we can listen longer!) Anyway, I’m so glad I came across your blog! Oh I didn’t know you could get the CD’s! I have heard him read it and it is fantastic! Love the idea of doing something special every evening during advent. Thanks for pulling these ideas together! Love Christmas!!! One of my favorite traditions is me and my family drive down to San Diego and go to the Mission Inn for a nice Dinner. The hotel is then covered in Lights and beautiful decor. So we get to walk around after we eat our nice dinner and we take pictures together and it’s a great thing to do with your family I love it!! fabulous read of Christmas traditions!!! I am looking for a new tradtion for our family I am I single mom and my daughter is 21 and still at home and this past September my mom moved in with us so want something fun to be enjoyed by three generations! 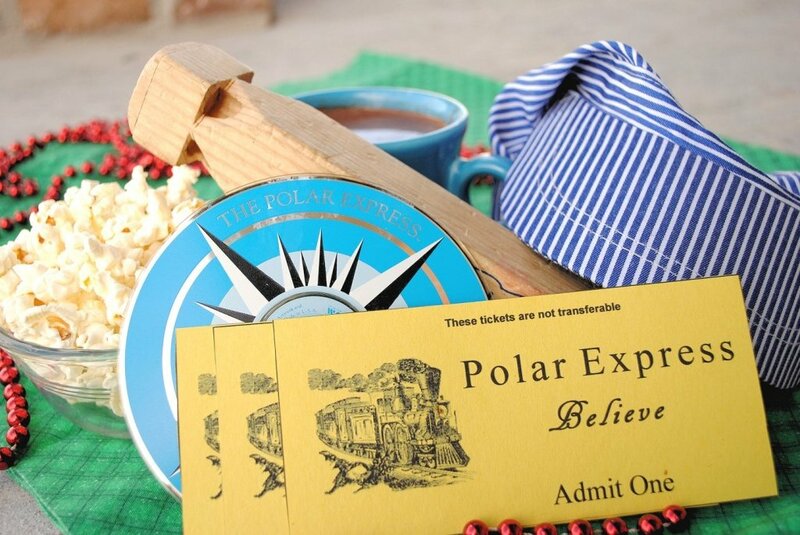 When my daughter was little we read polar express and she asked if she could have a bell from santa’s reindeer like the boy in the book, so she wrote her letter to Santa and Christmas morning there beside her stocking was a big bell tied with a ribbon and a note from Santa telling her it was Dasher’s bell her eyes were as huge as saucers! This started a tradition each year she would ask for a special gift, one of the elves hammers, an apron from mrs clause, frosty’s hat, a key to santa’s workshop and each year they appeared with a special note from Santa. I look forward to doing this for my grandchildren one day! Great post. Got plenty of ideas from it. What great familyideas for Christmas! We have a large family with lots of kids so sometimes we need to find new ideas to use during the christmas get together. Thanks for sharing. This is such an awesome list! I can’t wait to do all these! My favorite traditions are new PJ’S for Christmas Eve, custom designed by me photo ornaments personalized for each child under 18 and each household and my husband reading Night before Christmas. We recently added the Christmas Eve box. This year for Christmas, my fiance’ and I have all of our children coming together in one small house. I don’t want anyone to feel out of place or that they have to spend money that they don’t have on gifts. I want it to be more about our time together than what is under the tree. Our children range in ages from 18-23 and there will be 7 of them. There will also be 2 grandchildren (5 and 10 months). I could use some suggestions to help blend our children so they enjoy our time together and feel like family. Thanks in advance for any helpful ideas!! Three years ago, before my mom passed away, she asked me to write about our family tradition so that others who wanted to make Christmas more about Jesus, would get some good ideas. The book is called The Good News Box. I know my mom is smiling and I hope this inspires someone to start one of the traditions listed. I love making memories with my family and there were a lot of great ideas shared here. When you told me about giving Christmas gifts to neighbors and getting one in return, it gave me an idea. I have a neighbor who used to be a sailor and is now retired and collecting navy-related items as his pastime. I will help add to his collection and get him a nice present by finding a custom treasure chest maker. Doing this will not only help him be cheerful during the holidays but also give a little joy during his retirement as well.